Disney will introduce its first little girl princess with the debut of "Sofia the First: Once Upon A Princess," an enchanting, music-filled animated Disney Junior television movie for the whole family, SUNDAY, MAY 19 at 11.00am on Disney Channel and MONDAY, MAY 27 at 1.00pm on Disney Junior. 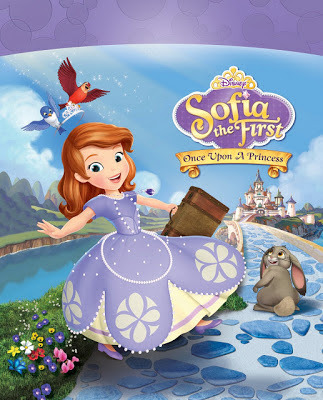 A "Sofia the First" television series will premiere in July 2013. Sofia's royal adventure begins as she prepares to move into the castle with her mom, starting a new family with her step-father, King Roland II, and step-siblings, Amber and James. Helping Sofia in her journey are the three headmistresses of Royal Prep Academy - Fauna, Flora and Merryweather (the beloved fairies seen in Disney's classic "Sleeping Beauty") and royal steward, Baileywick, as well as a group of cute woodland creatures led by a wise-talking rabbit, Clover. Sofia soon discovers that looking like a princess isn't all that difficult, but displaying honesty, loyalty, courage, independence, compassion and grace is what makes one truly royal. Created for kids and their families, the stories of "Sofia the First" communicate positive messages and life lessons that are applicable to young children. While she lives in a captivating world of castles, wizards and flying horses, Sofia remains a relatable peer-to-peer princess who is experiencing many of the same social situations as young viewers at home including learning how to fit in, making new friends and mastering new skills. "Sofia the First: Once Upon A Princess" stars the voices of Ariel Winter ("Modern Family") as Sofia; Sara Ramirez ("Grey's Anatomy") as Queen Miranda; Wayne Brady ("Let's Make A Deal") as Clover; Tim Gunn ("Project Runway") as Baileywick; Darcy Rose Byrnes ("Desperate Housewives") as Amber; Zach Callison ("Land of the Lost") as James; Travis Willingham ("Ultimate Spider-Man") as King Roland II; Jess Harnell ("Doc McStuffins") as Cedric; Ashley Eckstein ("Star Wars: The Clone Wars") as Mia the Bluebird and Meghan Strange ("Special Agent Oso") as Robin. Disney Legend Russi Taylor (Minnie Mouse), Barbara Dirickson and Tress MacNeille (Daisy Duck), bring Fauna, Flora and Merryweather, respectively, to life. Jennifer Hale provides the voice of Cinderella. Craig Gerber ("Pixie Hollow Games") developed the movie and serves as co-executive producer and story editor. Jamie Mitchell ("Special Agent Oso") is executive producer and director. John Kavanaugh ("Winnie The Pooh: Springtime with Roo") serves as songwriter/music director and Kevin Kliesch ("Tangled Ever After") is the composer. "Sofia the First: Once Upon A Princess" is a production of Disney Television Animation.